Within Reach documents one couple’s pedal-powered journey across the United States in search of a new home in a sustainable community. 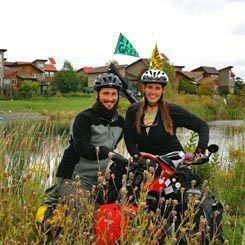 Mandy and Ryan have given up their corporate jobs and their traditional houses to "bike-pack" thousands of miles around the USA, looking around the world as they look within themselves. Their journey and their film attempts to answer the question that they (and many others) are asking: Is it possible for all of us to live in a sustainable way? After circling the country, and talking with over 20,000 people, the Creightons have found that not only is it possible: it's already underway.